Here’s the whole story of beautiful skin in one word: moisture. 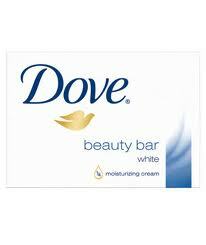 Now you know why Dove® created its ¼ moisturizing cream and put it into a beauty bar. For best results, use daily. In skincare, everyday is everything. I can tell you that I love Dove, and use it everyday. It keeps my skin clean, fresh, moisturized and smelling so nice. Some people I know think the scent of the beauty bar is too strong, but I think differently. Yes it is a strong scent, but not as strong when it is on your skin. The scent is much softer. I also enjoy the smell as it wafts in from my ensuite bathroom, waking to the soft scent of flowers is nice. I love how soft my skin feels all the time, and know this is due to the moisturizer in the soap. Being someone who suffers from dry skin, especially in the warmer months, this soap keeps my skin moisturized and without the leather look. So you have to know I am going to stay a faithful Dove user. Really there is no better product to suit my needs. DISCLAIMER: I received a sample for review from ChickAdvisor. I was not compensated for this post or my opinion.